Are We ISIS In Slow Motion? In an earlier post I promised to talk about religion and how it relates to what we do at FTF. The events in Paris this week make this a good time to reflect on the word religion. Let’s start with the basics and look at the word itself. Cicero, the famous first century BC Roman philosopher and historian, believed the word was derived from the Latin relegere, “to go through again”. He connected it to “going through” holy documents over and again. However, many others, folks like Servius and Lactantius rejected this understanding. They connected the word religion to the word religare, “to bind fast”. Our modern word ligament is a derivative of the same root, “lig”. Most since have agreed that the word has something to do with “binding or tying together”. But binding and tying what? For the emperors Nero, Trajan and Diocletian (and others), religion was an idea. It was the idea that bound society together. Religion was the seminal belief or narrative that united people. For most Romans the key religious idea was Roman law as personified in the cult of the emperor. What was a Roman, after all, other than one who exhibits civitas; a respect and reverence for the law and in turn, the law giver? The Roman body politic had ligaments. It had a binding idea. It had a religion. And that is why Romans of the first, second and third centuries could call Christians and Jews atheists. And they did. These monotheist outliers refused to be bound, they refused to accept the ligaments that held Rome together and in turn they were amoral, atheistic, apostate. They lacked religion. And this became clear whenever the Roman government asked its citizens to burn incense to the emperor as a show of “good faith”. Christians and Jews refused. Some barbarians refused too. All the “amoral” people refused to be a part of the body. And boy did they pay for it. 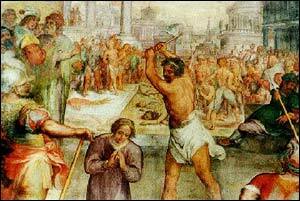 Check out how the Jews suffered in 70 AD. Christians too, suffered terribly. Boiled in oil. Flayed. Sound familiar? ISIS 101. And guess what, nothing has changed. And neither will it. Every society, every culture, by definition, has ligaments. There can be no culture without a religion. Think about it. How could a person possibly count themselves a part of something if that something lacks defining qualities? What would it mean to be a Jets fan if being a Jets fan meant you could root for the Patriots (heaven forbid). I mean you couldn’t even be a football fan if there weren’t binding ideas about what football is. And this goes for everything. What does it mean to attend Main Street High School? And how does attending Downtown High School make you any different? Religion is that which binds us together. It is the controlling idea, the thing that unites some and separates others. And now for the newsflash: There’s nothing wrong with this. It is how we earthlings work-- we who are bound to earth and dust and dirt. We can do nothing if not make religion. The question is not whether or not you have a religion, the question is which one has you? You are bound. You can’t help it. The question is to what will you adhere? For ISIS the religion question is simple. They are bound to destruction. They are nihilists. That is their binding idea. They seek destruction and wrap it in some quasi Islamic parchment paper. In Paris, as in Beirut two days earlier (and in Syria daily), their religion is on display. And they don’t shrink from it. We in the west, however, have a much harder time with this word. Our deeply held beliefs about individualism makes us rebel against being bound. In fact, it is individualism itself that binds us. It is our religion. It is what unites us, however loosely. And it is also what will destroy us in the end. There can be no culture, no creative force for good if each of us believes only in ourselves; as if a million different cells operating apart from one another in a body could create anything but illness. Our religion, the religion of self, cannot sustain the body (politic) because on it's own it is a cancer. Yes, to create and keep and grow a culture, humility is necessary. Individualism without humility will destroy all things in its way. Unfettered individualism is ISIS in slow motion. It’s dangerous and in the end will be just as brutal, too. Maybe worse. But what does this have to do with First Things Foundation. I mean isn't this a deveopment blog? Gosh! Well, we at FTF have a binding faith in the beauty of humility and the necessity of relationships. We aim to give our lives by leading them simply and in the service of others. We try and meet suffering where it resides, in the heart of men. We believe a broken and contrite heart will not be despised. That is our ligament. If it is yours, or a part of yours, consider supporting us in the field. Consider being a ligament in a culture of giving. Peace!